Life of Pi is truly spellbinding. But then again, what else is to be expected? Ang Lee has won two Oscars for his directing, the poetic Crouching Tiger, Hidden Dragon and the perfectly formed Brokeback Mountain. Yet Lee’s name is not chimed as often as that of other champions of Hollywood. Perhaps his Taiwanese heart is secretly driving his movies to their end result – somewhat off-kilter; it would be restricting to call Brokeback a gay film since it isn’t really a gay film; Crouching Tiger is a kung-fu film that isn’t really a kung-fu film; and the ensemble masterpiece The Ice Storm (based on a novel, the writer of which was so pleased that he sobbed throughout the credits at the film premiere), which is a family drama that isn’t so easily definable as such. 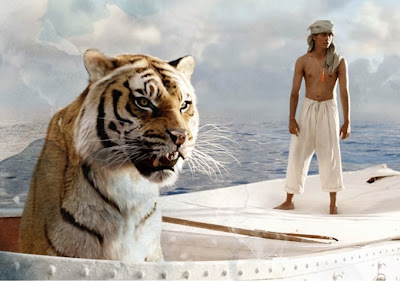 And again, with Life of Pi he gives us what we could not have expected. Not since Werner Herzog’s documentary Cave of Forgotten Dreams has 3D been used with real intent and craft. From the cinematography and staging, to, quite remarkably, the editing, every moment has been considered and realised as a 3D film. There is still significant light loss due to the uncomfortable sunglasses necessary to watch it, but the bright and painterly visuals do a lot to compensate. Pi is a teenage boy who lives in a Zoo in India. Due to economic difficulty, his family takes their zoo animals and travels with them over the ocean to sell them off in America. In one of the most emotional sequences at sea ever, tragedy strikes, and eventually Pi finds himself stranded on a boat with a tiger. A tiger, which at moments I subconsciously analysed and definitively defined as real and other times digital, turned out to be digital the entire way through. Computer graphic imagery has never been so convincing and beautiful. Another breakthrough in what is becoming more and more common in huge budget American cinema. The film is constantly gripping despite narration by a middle-aged Pi. What results is less a survival story and much more a wonderful parable with the visual lyricism and delicate acting worthy of poetry. Without saying too much, the ending is a punch to the gut, in the most sincere, solemn and mesmerising way. Imagine such a punch!